The Town Council consists of twelve councillors and each year one of the twelve members is elected to the office of Town Mayor. The Mayor-Making ceremony is followed by the traditional penny throwing, where the newly-created mayor throws new pennies into the street for the children to scramble for, is held at the Town Hall in May. The Council had the authority to appoint Honorary Burgesses. This honour is bestowed upon individuals who have made a significant contribution to the benefit of the people of Hedon. The first people to receive such an honour were Dr. Harry Marshall, Cllr. Leonard Sharpe and Cllr. Henry Vies Suggit M.M*., J.P* who was Mayor of Hedon nine times. "Mr. Hedon," Doug Goulsbra M.G.M.B. is currently an Honorary Burgess of Hedon and was for many years the Mayor's Sergeant-at-Mace. Prior to 1974 Hedon had a Borough Council and the last four Freemen appointed were Cllr Hilda Ives MBE, James Watson, Mrs. Alison Todd (Alison Hall) and Sydney T. Johnson. Hedon Town Council recently bestowed the title of Honorary Freeman of the Town of Hedon on Dr Martin Craven and Dr John Markham for their contributions to the town through the Hedon Museum, recording and sharing the history of Hedon and their services to the town council through various silver shows throughout the years. The Town Council and its committees meet in the Town Hall which was built in 1692 by Henry Guy, M.P. * For Hedon. He also presented the Great Mace, which is carried by the Mace Bearer on civic occasions, to celebrate his election to Parliament in 1669. A large portrait of him hangs in the council chamber, formerly the courtroom, together with a similar portrait of William Pulteney, M.P. for Hedon in 1705, who later became Earl of Bath, Baron of Hedon and was Prime Minister for a DAY! Henry Guy's Coat of Arms can be seen above the entrance to the Town Hall. Various Charters enabled Hedon to hold regular markets and fairs throughout the year. Hedon was the focal point for agricultural businesses in south Holderness and still remains the main centre for people to shop and meet for social occasions. 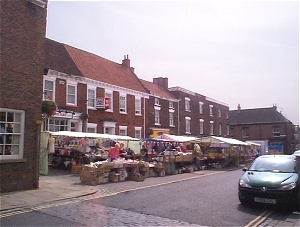 Hedon still holds a market every Wednesday in the Market Place which, though small, has a good variety of stalls. At the turn of the century (19th / 20th) the population was around 1,000; with all the development that has taken place and that which is currently projected, the population has risen to over 8,000. The Council over the years has had a difficult task trying to blend the new with the old. One major success is the historic centre of the town, with the majority of the original buildings being retained. The centre creates a friendly community atmosphere in which old and new residents, together with visitors from outside the town, are made to feel welcome. The Council in 1999 produced a 25-year Structure Plan which included many recommendations received from the public during the consultation period. This was presented to the East Riding Council and other appropriate bodies in the hope that it would be adopted so that the residents of Hedon had a greater say in the future of their town. The Hedon Town Council is now in the early stages of reviewing this plan and utilising it to produce an updated version. Hedon offers excellent shopping facilities for the area and is well served by public transport. Free car parking space is provided, and there are many organisations serving a wide range of interests for all ages.